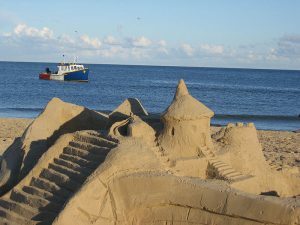 I have been reading a little bit about the background of the Madelinots, as the inhabitants of the Magdalen Islands are called. Many of them are descended from Acadian settlers. 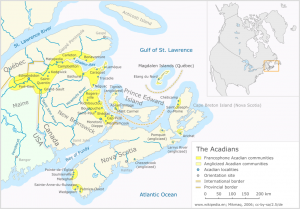 The Acadians were originally settlers from France who crossed over to the new world and settled in eastern Québec, the Maritime provinces and part of Maine. The Acadians are expelled from their home. After British conquest as a result of the French and Indian war, the French speaking Acadians were expelled from their burning cities and wandered in exile as outcasts, due to their refusal to swear allegiance to the British crown or to renounce Catholicism. The exiled Acadians departed in hastily built boats and sought exile in France, England (not good choices), the colonies from New England to Georgia, Haiti and the Caribbean Islands as well as (most notably) Louisiana, where they became the Cajuns. 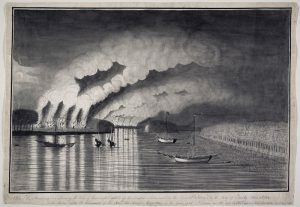 Eventually, many returned to Canada and the Maritime provinces (New Brunswick, Nova Scotia and Prince Edward Island) and the largest populations today can be found there, along with the Cajuns in Louisiana. Acadians made their way to the Magdalen Islands when a group of 22 settled there in 1765, with other groups following as late as 1793.